The recall fight, prompted by Walker's decision to deny Wisconsin union workers collective bargaining, is finally over. 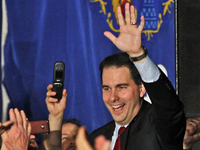 Scott Walker has been declared the winner over Democrat challenger and Mayor of Milwaukee, Tom Barrett. Walker’s victory is an undeniable setback for organized labor, which spearheaded the campaign by helping to gather some of the more than 1 million signatures on recall petitions. And the June election was also a test of get-out-the-vote strength, with Barrett’s allies spending twice as much as the governor’s side to mobilize voters. Walker infuriated the opposition when, months after taking office last year, he pushed through legislation that effectively ended collective-bargaining rights for most state workers, triggering massive street protests. Walker defended the move in the campaign’s final debate, saying “we drew a line in the sand” and that public employees needed to pay more for their benefits.